Televue 3.7mm Ethos SX Eyepiece - 1.25"/2"
The 3.7mm Ethos-SX, or "Simulator Experience" eyepiece, the world's first astronomical eyepiece with a 110º Apparent Field of View! This breakthrough eyepiece has the same field as the optics aboard the LEM Simulator, used to train astronauts who were preparing for lunar landings. The 3.7mm Ethos-SX has a 1.25" barrel but comes with a screw on 2" adapter. Eye relief is a comfortable 15mm on this eyepiece, and it also accepts the Tele Vue Dioptrx astigmatism correction products. Al Nagler eagerly pushed Ethos designer Paul Dellechiaie to extend the new 3.7mm focal length to reach 110°, the same field as the LEM Simulator optics Al designed 45-years ago to train NASA astronauts for lunar landings (look in the Articles tab for a downloadable PDF that has more info and pictures of the LEM.) Years after the LEM program, the memory of the 110° view of the simulated lunar surface moving through the triangular cabin window of the LEM inspired Al to develop an “Ultra Wide Angle” (his patent title) telescope eyepiece to approach that “simulator experience.” When the 82° Nagler eyepiece hit the observing fields, it changed how amateur astronomers viewed the heavens. An early customer dubbed it a “spacewalk” view. Essentially, “the experience” is about creating an image as natural as one sees with the unaided eye. With Paul's help, Al's initial dream for amateur astronomers is now fully realized. The Tele Vue 3.7mm Ethos-SX eyepiece is designed and crafted to combine its exceedingly wide field of view with all the contrast, color-rendition, distortion correction and center-to-edge sharpness needed to achieve that natural view. Beyond the desire to simply achieve 110°, the extended field of view gave Tele Vue the ability to produce a superb planetary eyepiece with a deep sky true field of view that logically fits within the rest of the Ethos eyepiece line. With 110°, the Ethos-SX has 21% more AFOV area than the 100° Ethos design. This permits a nice 62% power increase from a 6mm Ethos, while retaining 68% of its TFOV. The 3.7mm actually has more TFOV than our 8mm Plössl, 6mm Radian, and 5mm Nagler Type-6! 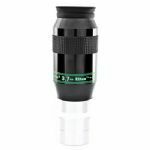 The 3.7mm is a 1.25" format and is parfocal with the wide range of 1.25" Tele Vue Plössls, Panoptics, Radians, Naglers, Nagler Zooms, and 6mm and 8mm Ethos eyepieces. The screw-on 2" adapter (included) is designed to make it parfocal with 13mm and 10mm Ethos when they are used in their 2" modes…Hey, it also doubles as a functional display stand! We don't think we can aptly describe Al’s original experience of “flying over the moon,” but for the first time, YOU can experience what the astronauts saw four decades ago! Weight: 1.10 lbs / 17.7 oz. ; 2" adapter/stand: 2 oz.